In this edition of Making Oregon, our guest is Joe Mueller, founder and proprietor of the downtown Portland clothing maker Wildwood & Company. They make high-quality and stylish suits and shirts by hand in their on-site workshop, keeping the traditional craft of hand tailoring alive. A native of Banks, Oregon, Joe started Wildwood in 2014 after an impressive run as a lawyer – he graduated first in his New York law class and worked in top-notch law firms in New York City and in Portland. 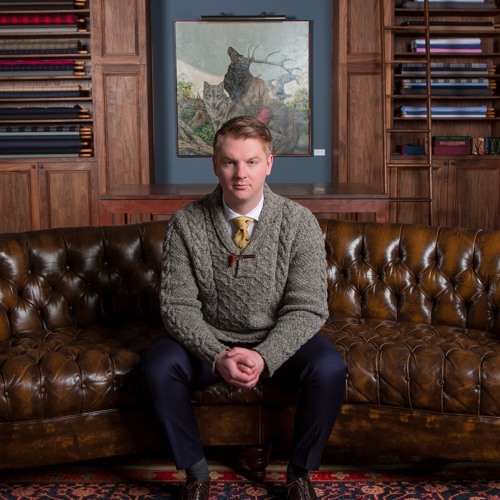 While in Portland he noticed that the long-time New York tradition of the “bespoke” suit, a suit handmade to the customer’s detailed specifications, was nowhere to be found in the Rose City, which sparked his entrepreneurial idea – Wildwood & Company. Our conversation takes place in Joe's wonderful lounge fitting room, a walnut-paneled lounge with posh leather furniture, and adorned with cool art, bolts of beautiful fabrics, and great scotch - a perfect complement to the stylish, traditional, high-class and hand-made suits Wildwood is making here in Oregon.